Nice word. Connotes all we love and treasure in our day to day going about. Beer? You bet! Concert tickets, car interiors, memberships and the list goes on. There is one premium that isn’t as loved as friend Mojo explains. Yes, seems our friend Mo — everybody’s Joe — got his AA cracked but it paid well. That is an unusual occurrence that I’ll let him tell you about. Brought up an interesting topic though that we all encounter. The meek weak-passive shall inherit the earth — to paraphrase. I admit to long having troubles with a collection of them at a table. When I started online, the “cheap” game on the site was .25-.50 and I managed to play poorly but less luckily than the collection of idiot chasers that became my online lot in life. My blog and every other poker blog will, at times, bemoan the Premium hand that goes down in flames. It is always that “everyman” that does it. In the 50’s they were called “fellow travelers” and tared by McCarthy. Let’s bring back the star chamber! If you click on the Stud category on the right there, you’ll see me resolve my issues with the those pinko weak-passives. It isn’t all that positive in EV but it is the best I’ve come up with. And it is counter-intuitive when you think NL. Why do we raise? “Raise to isolate”, right? Doesn’t work. You have to play a trapping game. You fold more flops against weak better without seriously improving. You raise only in late play. You do “waste” chips in the most boring manner possible. All fun is missing. The benefit is the benefit:cost ratio is on steroids from all the come-along Charlies. That makes it less about hands as it is about pot odds letting you do things you’d never try at NL. That’s the single ray of sunshine. Chasing your flush can be +EV. It is said that it is very hard to be an equally skilled tournament and ring game player. It is even worse to be that at limit and no-limit. What it comes out to is that limit rewards the selective-weak-passive beyond all reason. I’ve had friends that were limit grinders. It is a profitable world if you can stand the paint pallet — all grey. Going back to that limit Stud tournament, it was first gear. That gear is preservation strategy with trapping the only fun. It was the way to navigate to blind-antes that turned it into a version of NL. You played like a putz to get to the good part. Ring Limit Hold’em never gets to the good part. Grind baby grind. Might make you a better NL player in the long run. As Rob and company were discussing, “Can you fold KK?” — knowing limit makes it easier and provides a modified decision tree that links to Negreenu’s small pot poker concepts. And, a lot of his ideas about small, suited connectors come right from the limit playbook. Now that I have explained how to play limit ring, why would you ever want to? Take a look at what should be the real future of health care. I have a friend (Sim) who is successful at the Horseshoe Casino Tunica $4/8 limit game. 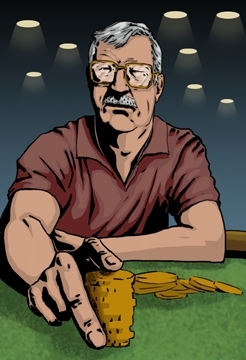 He raises, bets some more and keeps on betting, even when he has A-K and whiffed. you would think that raising doesn’t help, but it works for him. I’ve seen him buy in for $100 and run it up to $1100, which is unbelievable at those stakes. Also, if you’ve been betting and a third card of a suit comes on the river and a donk now bets, you can believe that they’ve hit their flush (and sometimes fold to save the $6 even in a $50 pot). The word bluff doesn’t exist for most of the players and the few who do are quickly identified. It was fun in a perverse way and I’m sure I could become much better at the game. One effect is he’ll tend to have the better players in fewer hands. More the case if he’s taking down hands regularly. There should also be a line at the station for seat changes by those on his right. He makes it hard for the decent players to make their regular profit. Another thing that should benefit him with weaker tables than average. If you can get on his off side, you can be speculative and trap. That isn’t an easy route and tends to limit risk:reward. You roomed with him in Vegas. Did you notice an odd, horseshoe shape to the back of his skivvies? Limit can be fun but so many think NL NL NL and that brings a frustration level that grows. So much of it is the great pot odds that it often provides. How often to you get to play suited one offs and the like? It is hard though to bet the come like he does. I once had a heck of a run at Limit at Excalibur in Las Vegas when I was relatively new to poker. I thought, “If I can do this every night, I’ll make a fortune.” Muhahahahahaha!